Aren’t you absolutely amazed? Aren’t they cute? Did you notice the icing? Can you believe “I” made them? So many questions, I know… but you have to be amazed. Because I certainly am. Granted, this baking adventure was not drama-free. 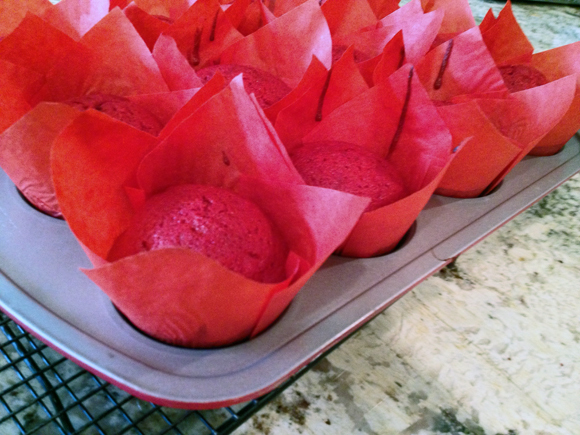 Heat oven to 350 degrees F. Line cupcake tins with paper liners and set aside. In a large bowl, whisk together cake flour, sugar, cocoa powder, baking soda, and salt until well combined. In the bowl of a stand mixer fitted with the paddle attachment, combine eggs, oil, buttermilk, red food coloring, vanilla, and vinegar. Mix on medium speed until well combined. Add the dry ingredients to the mixer and beat first on low-speed and then on medium speed until smooth, about 2 minutes. Divide batter evenly between cupcake liners, filling each a little over halfway full. 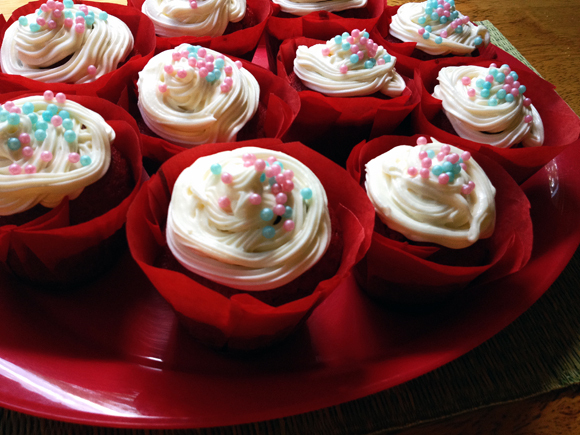 Bake, rotating pans halfway through, until a tester inserted in the center of a cupcake comes out clean, 16-18 minutes. Let cupcakes cool in pans for 5 minutes and then remove to a wire rack to cool completely before frosting. To make the frosting: Beat together the cream cheese and butter with an electric mixer on medium-high speed until fluffy, about 3 minutes. Add 3 cups powdered sugar and mix on low-speed until incorporated, and then medium-high speed until frosting reaches desired consistency, about 3 more minutes. For a stiffer icing, add more powdered sugar. Beat in the vanilla extract. Pipe frosting onto cooled cupcakes as desired. Store frosted cupcakes in the refrigerator. The stunning paper linings were a gift from our friend Cindy. 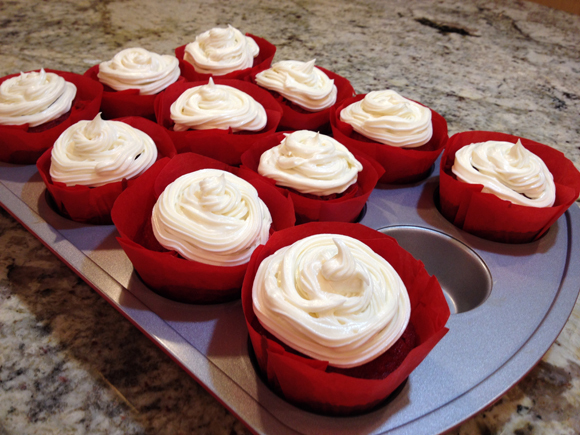 I decided to trim their tops after baking to make it easier to frost the cakes. I know my limitations. Everything was going on well, until it was time to frost the cakes. I was set on doing a good job on these, so I bought myself a pastry bag. Not a fancy one, but a disposable, single use plastic type. I filled the bag with the cream cheese frosting, took a deep breath, and went to work. All went smoothly for the first two babies, then all of a sudden, I squeezed and squeezed, and nothing came out of the pastry bag’s tip. I told myself – you are a P90Xer, you can certainly squeeze harder than that! – and that’s when I felt a moist, cold, sticky feeling on my wrist, the consequence of frosting that had found its way up instead of down, and not satisfied to reach midway through my arm, was now splashing on the floor. Not sure if you ever had to deal with this type of situation, but there’s only one word to describe it: messy. Very messy. 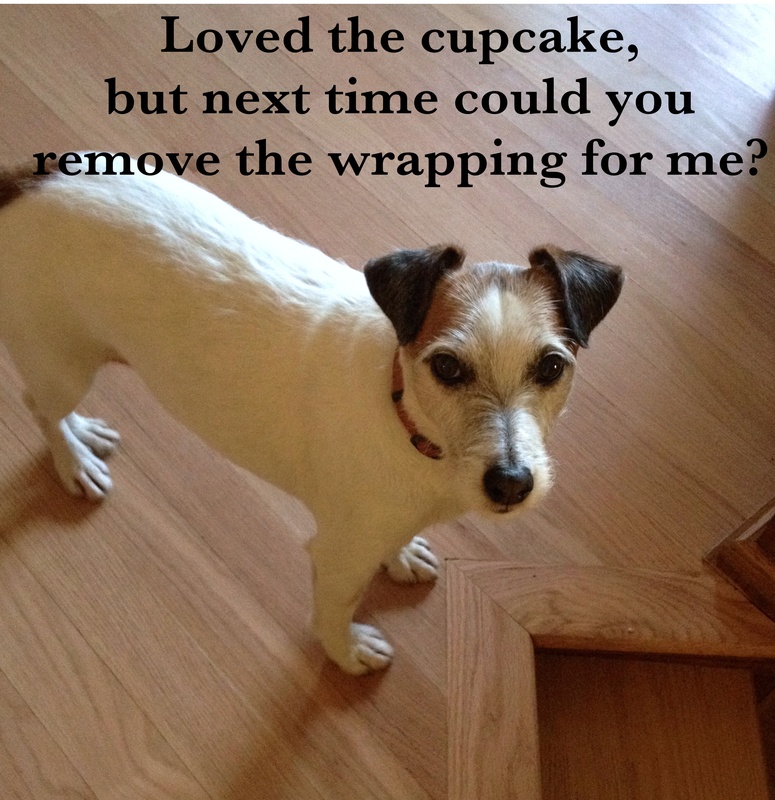 The bag gets slippery, the frosting refuses to compact down, and the Jack Russell gets overly agitated from the sudden intake of sugar. Chaos in the Bewitching Kitchen. Still, only one little cake was lost in that battle, due to jerky movements on my part and the merciless Law of Gravity. ONE YEAR AGO: Happy Valentine’s Day!